Vauxhall to sell radical Volt? | What Car? Vauxhall to sell radical Volt? 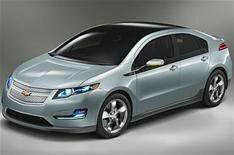 The radical Chevrolet Volt could be branded as a Vauxhall when it goes on sale in the UK in 2012. The Volt is the first mass-produced car that isnt driven by an internal combustion engine: instead, the front wheels are driven by a battery-powered 148bhp electric motor, with 273 lb/ft of pulling power. The battery has a range of 40 miles on electric power only, but can be charged for a range of up to 400 miles by a small petrol engine. It's top speed is around 100mph. The Volt can also be charged by plugging it in to a mains supply, which takes three hours to complete on a 240 volt system. The car will go on sale in the USA in 2010, and is expected to be sold in Europe from late 2011 or early 2012. It's expected to cost around 20,000. However, it's unlikely to be branded as a Chevrolet in the UK, opening the possibility that it will be sold as a Vauxhall.